Taipei, Oct. 31 (CNA) The new de facto U.S. ambassador to Taiwan on Wednesday pledged to continue to promote Taiwan-U.S. relations, listing the top priorities during his three-year tenure as promoting U.S.-Taiwan security and economic ties; Taiwan's role in the global community and people-to-people ties. 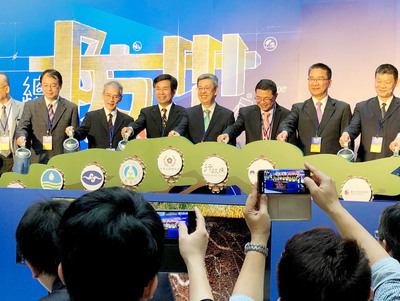 At his first press conference in Taipei as Director of the American Institute in Taiwan (AIT), Brent Christensen, who assumed office in August, reaffirmed the U.S. commitment to Taiwan. "For almost 40 years, the Taiwan Relations Act and the three U.S.-China Joint Communiques have served as the foundation of our 'one China' policy that has guided our relations with Taiwan and the People's Republic of China," he said. He stressed the long-held U.S. stance that any effort to determine the future of Taiwan by "other than peaceful means represents a threat to the peace and security of the Western Pacific area and is of grave concern to the United States." "We are opposed to unilateral attempts to change the status quo," Christensen added. Meanwhile, the AIT chief said the U.S. welcomes efforts on both sides to engage in dialogue that reduces tensions and improves peace and stability in the cross-strait relationship, against the backdrop of ongoing tension since President Tsai Ing-wen (蔡英文) assumed office in May 2016. At the press event, Christensen highlighted the four areas he sees as priorities during his tenure, including the promotion of U.S.-Taiwan security cooperation; U.S.-Taiwan economic and commercial relationship; Taiwan's role in the global community and people-to-people ties. In terms of supporting Taiwan's ability to defend itself, Christensen pointed out that the U.S. recently approved the second arms sale to Taipei in two years, worth US$330 million. "Our obligation to support Taiwan in maintaining a sufficient self-defense capability against coercion is a foundational element of the Taiwan Relations Act," he said. On economic and trade fronts, the AIT chief said Washington sees value in further improving already strong economic ties with Taipei. "This was underscored by Secretary of State Pompeo in his speech last July about our free and open Indo-Pacific Strategy, where he noted the important role that Taiwan can play in this strategy, including in the areas of the digital economy, energy and infrastructure." Another major focus will be U.S. support for Taiwan's international participation, Christensen said, adding that the world cannot afford to exclude Taiwan as it faces a number of global challenges. "The United States has long been a vocal supporter of Taiwan's meaningful participation in international organizations, and we continue our informal consultations and engagement to allow Taiwan to have a more substantive role in the international community," he said, adding that the country's broader participation on the world stage will have benefits for the global community. The fourth and last focus is promoting bilateral people-to-people ties, he said, adding that he hopes to see more US states open representative offices in Taiwan to promote business and tourism. Christensen, who has nearly 30 years of diplomatic experience, replaces former director Kin Moy, and previously served as AIT deputy director from 2012-2015.